The recently enacted American Recovery and Reinvestment Act included policies to help struggling families and create jobs. But an extremely effective and simple policy that achieves both of these goals is often overlooked: increases in the minimum wage. Each increase provides financial relief directly to minimum wage workers and their families and helps stimulate the economy. By increasing families’ take-home pay, workers gain both financial security and an increased ability to purchase goods and services, thus creating jobs for other Americans. These results demonstrate that an increase in the minimum wage would not only benefit low-income working families, but it would also provide a boost to consumer spending and the broader economy. Aaronson, Daniel, Sumit Agarwal, and Eric French. 2008. 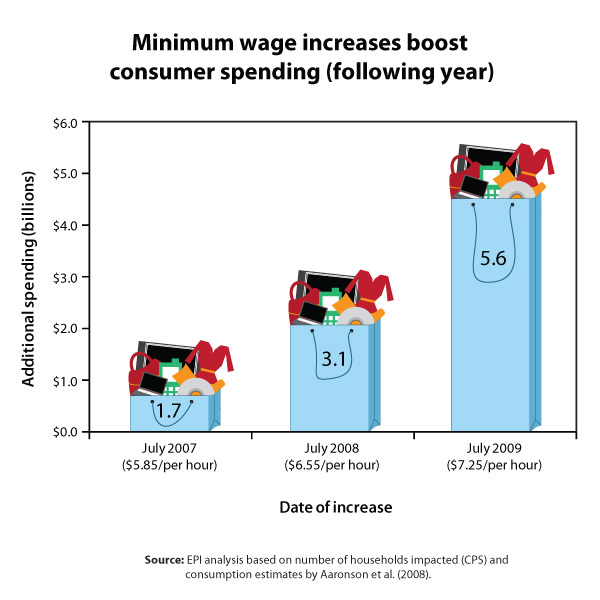 The Spending and Debt Response to Minimum Wage Hikes. Working Paper. Chicago, Ill: Federal Reserve of Chicago. 1. This assumes a two-step increase, first to $8.25, then to $9.50 a year later.